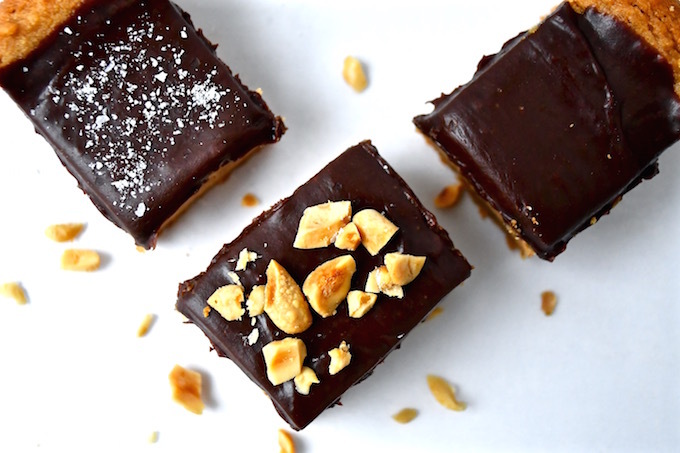 For anyone that loves the combination of chocolate and peanut butter, these Chocolate Ganache Peanut Butter Bars are a must. 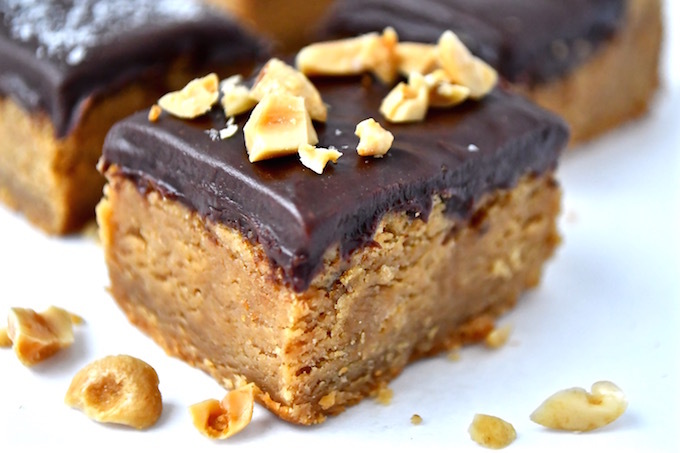 Thick chewy peanut butter bars topped with silky chocolate ganache are simply irresistible and decadent. No mixer required. 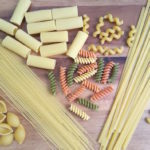 I have been working on this recipe for years. My first goal was to produce a moist chewy bar loaded with peanut butter flavor. I have tried all natural peanut butter and the type we grew up with before all natural was a thing. The all natural peanut butter didn’t produce the results I desired partly because it separates. 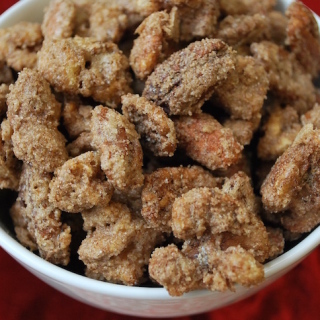 I also tried grinding roasted peanuts with flour to create a peanut flour. I figured it would add a nice crunchiness to the bar along with flavor. Instead, I found it was an extra step that wasn’t worth doing. The bits of peanuts were good, but it made you choke at times because it was harsh against the throat. It was not fun asking people to eat your bars and have them cough after chewing. So, unless you are prepared to perform the Heimlich maneuver, I suggest we skip this step. My original recipe called for using a mixer to cream the butter, peanut butter, and sugars together. I was lazy one day and melted the butter and used a whisk to combine the peanut butter and sugars and found that produced a chewier bar. Of course, I should have known that already since I use the same technique making my Congo Bars and Oatmeal Cookies. So, no need to take out the mixer for this recipe. A little arm workout is totally worth it. The bars come out thick and chewy. When removing them from the oven, the top of the bars should look even. After cooling, the top will sink a bit and that’s fine. The higher edges form a reservoir to contain the chocolate ganache poured on top. These need to be refrigerated to allow for the ganache to harden. Lift the bars out of the pan using the overhang of parchment on the sides which act like handles. Slicing out of the pan is easier and gives a clean cut. 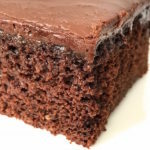 These are rich and decadent, therefore, you may want to slice on the smaller size. 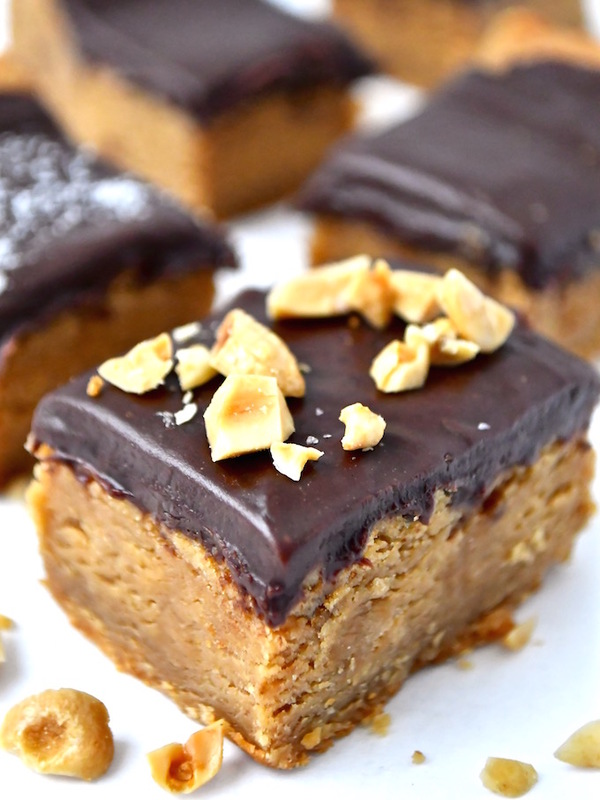 This is a must for anyone obsessed with the taste of peanut butter and chocolate. Make these and you will see what I mean. 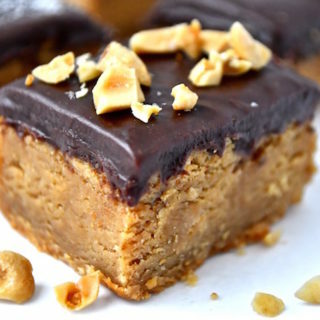 Thick chewy peanut butter bars topped with silky chocolate ganache are simply irresistible. 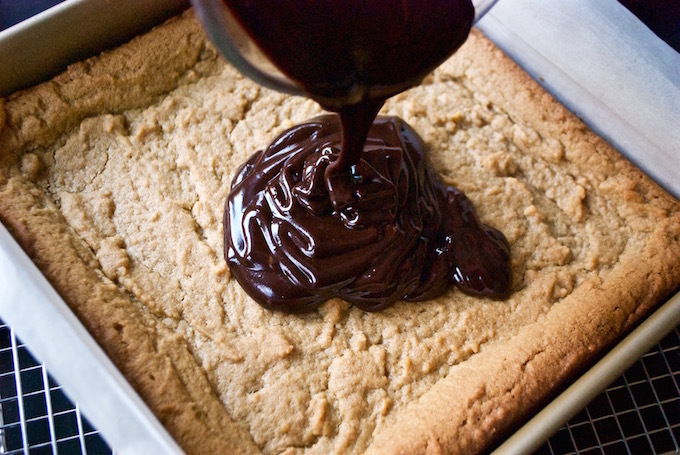 Grease a 9x9 inch square pan with butter or use baking spray. 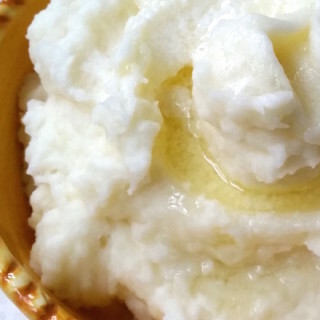 In a bowl of electric mixer, beat butter, peanut butter, and sugars until smooth, about 3 minutes. Add in vanilla and egg. Mix to combine. Spread evenly into pan and bake for 20 - 25 minutes or until golden and set. Combine the chocolate chips and heavy cream in a microwave safe bowl and cook in the microwave for 30 seconds. Stir with a fork as it acts as a mini whisk. Continue heating at 15-30 second intervals, stirring until chocolate is smooth and melted. Alternatively, place the chocolate chips in a small bowl. Heat the cream in a small saucepan until the edges start to bubble. Pour the hot cream on top of the chocolate chips and stir until melted. Pour ganache evenly over the bars. Spread evenly over the top. Place the pan in the fridge or freezer until the chocolate is set. 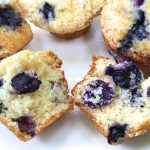 Once cooled, cut into squares. You can cut larger bars which will yield you 16 or smaller bars of 24. Top with your choice of toppings or serve plain.